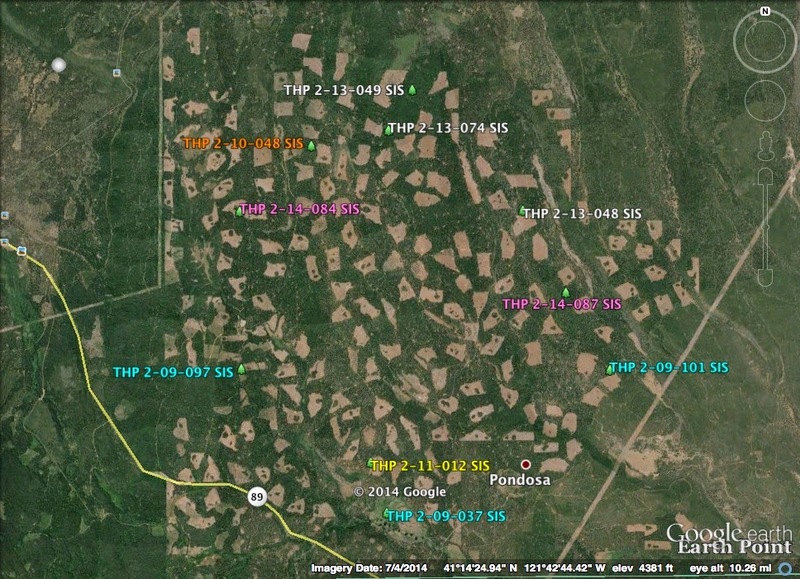 THPBlog: Roseburg Resources Company planning a pair of clearcut THPs near Pondosa, CA. Roseburg Resources Company planning a pair of clearcut THPs near Pondosa, CA. This THP is about 19 miles east of Mc Cloud, CA and about 2.5 miles NW of Pondosa at an elevation of 4,200 to 4,800 feet. Roseburg Resources Company is planning a clearcut tractor based logging operation in Douglas fir, white fir, incense cedar, sugar pine, ponderosa pine and lodgepole pine forests. Two tractor crossings are proposed for use within a class III watercourse (intermittent), and multiple roads and landings are proposed for abandonment inside watercourses. 17 road drainage sites are planned for work including rocking, dip construction and culvert repair and replacement. Greater sandhill cranes were spotted at Tom Young Flat and along the R Line road. Long haired star tulip was found at 3 locations including the NW and NE quarters of section 32, and near the center of section 5. Klamath fawn lily was found at 3 locations, all in the SE quarter of section 5. English peak greenbrier was found at 2 locations including the SE quarter of section 32, and the SE quarter of section 9. This THP is just west of Roseburg Resources Company’s Whitlowcenter THP 2-14-087 SIS. This THP is about 22 miles east of Mc Cloud, CA and about .5 miles NE of Pondosa at an elevation of 3,800 to 4,200 feet. Roseburg Resources Company is planning a clearcut tractor based logging operation in Douglas fir, white fir, incense cedar, sugar pine, ponderosa pine and lodgepole pine forests. There was a 2012 OR7 wolf sighting in the THP area, and Greater sandhill cranes were spotted at Tom Young Flat and along the R Line road. Long haired star tulip was found at 3 locations including the SW quarter of section 31, the SE quarter of section 6 and the NW quarter of section 18. This THP is just east of Roseburg Resources Company’s Atkins THP 2-14-084 SIS. More information is available on the THP Tracking Center website.